IN most Indian households, old newspapers and magazines either make their way to the trash or are sold off to the local scrap dealer. 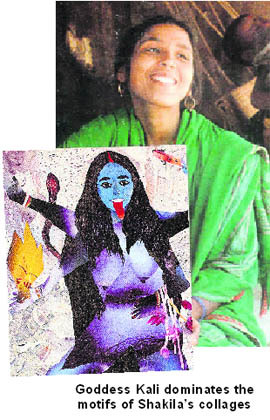 But, for Shakila Sheikh (39), a celebrated collagist from Nurgram village in South 24 Parganas district of West Bengal, such material is a medium for creating exquisite works of art. When Shakila welcomed visitors to her recent solo exhibition at the CIMA Art Gallery in Kolkata, she looked just like any other modest rural housewife. But one glance at her vast body of work on display revealed her astounding creativity — the large 8x12 ft collages were simply mesmerising. While her earlier works have been more pastoral in nature, with vibrant images of baskets of vegetables, domestic animals and mud houses, Shakila’s recent creations portray a darker side of life. In ‘Untitled 12’, there are birds soaring towards an unknown destination full of hope, while ‘Untitled 2007’ gives the artist’s take on terror and violence — it shows a man shown selling eggs that are mistaken for bombs. Some collages also reflect women living in distress and coping with conflict and violence. She says, "I may not read newspapers but I hear about women suffering, being harassed by people. I depict them as women and as mothers." At CIMA, admiring her wide array of work along with several other art lovers of Kolkata was B.R. Panesar, a senior collagist and Shakila’s mentor. "Shakila is a born artist," he declared. It was Panesar who had introduced Shakila to the world of fine art. He saw a spark of genius in her when she was a little girl who accompanied her mother, a vegetable vendor, to a market near his home. ‘Baba’, as Shakila respectfully calls him, recalls how he once saw her sitting forlornly with her mother at the market in Taltala. When he offered her a candy she, unlike the other poor children around her, declined. This impressed him and he gave her a colour pencil and paper to draw on, which she readily accepted. Shakila went to school only for about a couple of years and got married to Akabar Sheikh, also a vegetable vendor, when she was only around 16 years old. At the time, though she enjoyed drawing, she had not yet discovered the joys of collage art. All this while Panesar kept in regular touch with her. When he realised that the couple was having a difficult time making ends meet, he gave them used paper to make ‘thonga’ (paper packets) to supplement their meagre income. Soon she gave birth to three children — a daughter and two sons — and was completely pre-occupied with her domestic life. Then one day, in the early 1990s, on Panesar’s invitation, she went across to the Academy of Fine Arts, to look at his latest works. Akbar (45), recalls, "On our way back home in the local train, Shakila was strangely quiet. I asked her if she was sad, but she said, ‘no’. However, it was then that she decided that she, too, would become an artist." At first, Akbar did not give much cognisance to this. But when he came across one of Shakila’s collages, he realised that she was serious. "I saw the colours in those papers and they moved me. I simply had to get back to my first love," says Shakila. She asked Akbar to bring her a board on which she could start pasting the bits of hand-torn paper. After a few days’ work, the wonderful results were there for everyone to see. Akbar was so impressed that he took the artwork along to the market to show it off to his friends. He also paid a visit to Baba. "I was startled to see the collage. ‘Who has done this?’ I asked Akbar. He replied, ‘My wife, Shakila,’" said Panesar, as he slowly made his way around the gallery with the help of a stick, remarking on the marvellous colour combinations. "Look at the bazaar scene, the intricacies of the collage," he pointed out. There was no denying his pride in his prodigy who, he acknowledges, is a self-taught artist. The artist in Panesar immediately recognised that there was something unique in Shakila’s handiwork, and so he decided to put it up as part of an exhibition. The work was an instant hit. Thus began her journey towards becoming the prominent and celebrated contemporary artist she now is. Despite the support of her husband and her mentor, Shakila’s first forays into the art world were not easy. She faced a lot of opposition from within her conservative rural society. Also, they were not very happy that she was partial to the image of Goddess Kali, whom she has depicted in many of her works. Why Goddess Kali? "Somehow I like her power. I can relate to her as a woman. I close my eyes and I can see her. When I start tearing the pages to begin a new work, her image takes shape," she says. Today, however, her fame does not attract adverse comments. And contributing to her popularity are the numerous exhibitions her collages have been part of — national as well as at well-known galleries in Paris and New York. Personally, however, she has only visited Delhi. Shakila has achieved many an art milestone. The 2005 Charukala Award by the Academy of Dance, Music and Visual Art in West Bengal; the Lalit Kala Akademi felicitation in 2003; the Sanskriti Award in 2002; the honour of a Special Commission for the Gramin Bank installation for the International Trade Fair, Hanover, Germany in 2000; and, of course, the National Scholarship of the Ministry of Human Resources from 1993 to 1995. Despite the numerous accolades, Shakila is not resting easy, "I always want to improve. Every picture should be different." She constantly experiments with the medium and likes to use new materials. 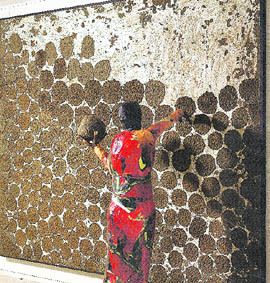 For instance, in one of her latest works she has made a three-dimensional image of a village woman from paper pulp, which depicts her putting ‘ghute’ (cow-dung cake) on the cottage wall. She has also used poster colours to achieve subtle colour combinations and better finish. But art has given Shakila more than creative satisfaction; it has enabled her to become economically independent and provide her children with a better life. With the money she has received by selling her works, she has also managed to build a house, which has been designed by the famous artist, Ganesh Haloi, who greatly admires her work. While her daughter is married and has a one-year-old son, her two sons are studying in senior classes. Her elder son wants to pursue a career in the arts, just like his mother.